Lease: Lease this 2018 Kia Sedona LX. Model# 64222. Total due at lease signing of $2,496.00. $4,000 KMF rebate is being applied. 36 monthly payments of $298.99. Total lease charge of $10,763.64. $0.00 Security deposit. Residual of $16,260.40. Cap cost of $23,243.00. Cap cost reduction of $2,197.01. MSRP $30,680.00. Acquisition fee of $650.00. On approved credit, min 750 FICO score. Based on 10000 miles per year, excess miles charged at $0.20 per mile. Early lease termination fee may apply. $400.00 disposition fee. Plus tax, license and title, and $125 title and registration processing fee. Option to purchase vehicle at lease end is $16,260.40. Financing available through KIA Motors Finance. See dealer for complete details. Photos for illustration purposes only. – Offer Expires: 09/04/2018. Total Savings Offer:*Stock# K16175. Subject to prior sale. MSRP $43,785. Dealer discount $4,184. 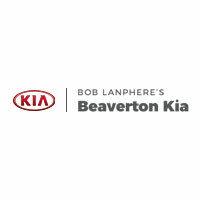 $4,000 Cash back from Kia Motors America, Inc. (KMA). Cash back offer when you purchase a new 2018 Sedona and may not be combined with finance or lease offers from Kia Motors Finance. This incentive is for a limited time offer on eligible Kia vehicles. Not all incentive programs are compatible. See dealer for details. APR financing available, subject to credit approval by Kia Motors Finance (KMF), through KMF, to very well qualified buyers and not available on balloon financing. 0% APR for 66 months = $15.15 cost per thousand borrowed. Offer expires 09/04/18. The Sedona was designed to give you luxury in every row. With a spacious cockpit and available second-row First-Class Lounge Seating, the Sedona proves that style can seat seven. Enjoy maximized legroom and luxury amenities in every row. The Sedona’s front row features an SUV-inspired center console for ample storage, while available Premium Nappa Leather Seat Trim and a Premium Headliner take comfort to a new level. 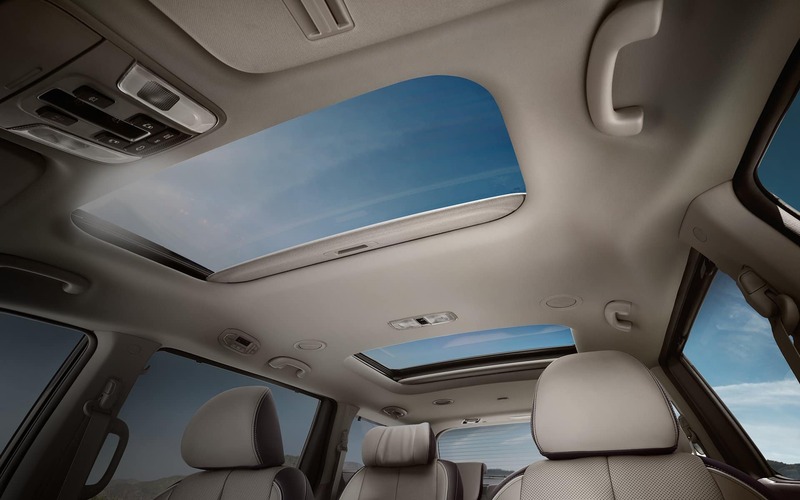 Take in the sunlight with the available Dual Sunroofs. Engineered for personalized comfort, each power-operated sunroof and sunshade tilts or slides open at the push of a button. 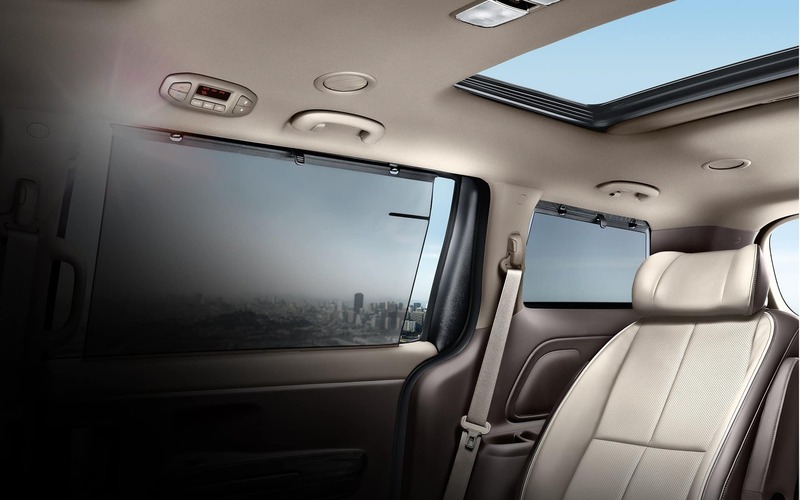 The available Second- and Third-Row Retractable Sunshades offer an even cooler cabin when you need it and help protect rear passengers from sun glare. Standard in every Sedona, the Rear-View Conversation Mirror keeps passengers in your line of sight without taking your focus off the road. The Sedona is indoor comfort impervious to outside climate. Heated Front Seats offer three heating levels to warm you up. Ventilated Front Seats have three fan settings to cool you down. Plus, the Sedona has available second-row heated seat cushions. The Sedona offers available active technologies designed not only to alert you of potential accidents, but also to help avoid some altogether. This includes camera-based Blind-Spot Detection (BSD), Autonomous Emergency Braking (AEB) that will automatically apply the brakes if it detects a collision risk, Lane Departure Warning System (LDWS), and the radar-based Smart Cruise Control (SCC) system that helps maintain a safe distance between you and the vehicle in front of you. Designed for ultimate convenience, the Smart Power Liftgate allows for touch-free automatic opening. Stand behind your Sedona, and the liftgate will automatically open when it senses your smart key—no hands, or feet, needed. Click below to watch the Smart Power Liftgate in action versus a competing tailgate system. Confidently navigate tight spots with the available Surround View Monitor (SVM). 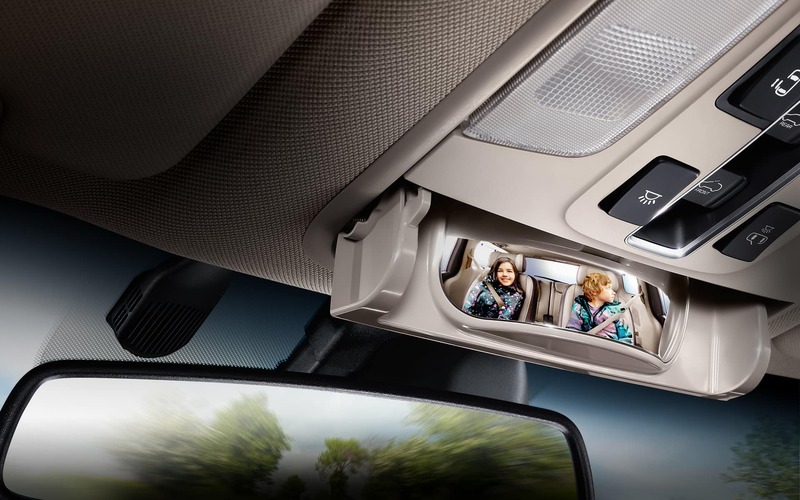 Using four mounted cameras, the Sedona projects a bird’s-eye view directly onto your in-dash screen. The result is a virtually 360° perspective for easier, more convenient maneuvering. When equipped with optional front crash prevention. 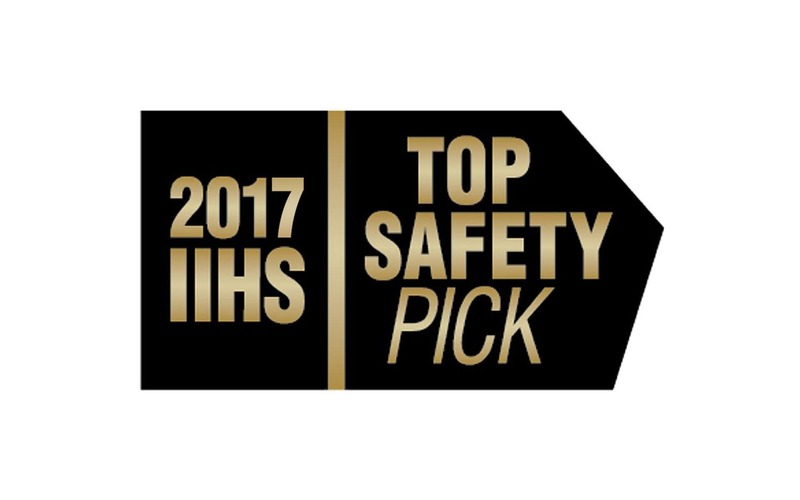 To qualify for a 2017 TOP SAFETY PICK, models must earn good ratings in the Institute’s small overlap front, moderate overlap front, side, roof strength and head restraint tests, as well as an advanced or superior rating for front crash prevention with standard or optional autobrake. 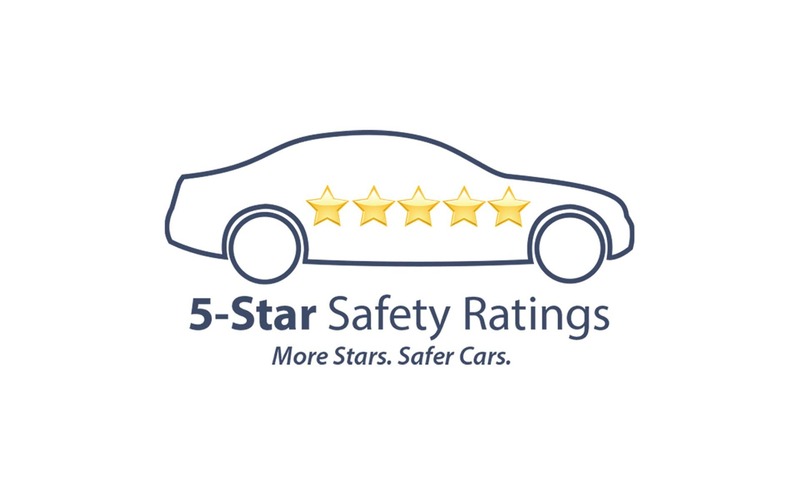 Headlight ratings are factored in only for the top award. Send in your info and one of our knowledgeable product specialist will respond shortly to schedule a complete demonstration of any Kia of interest.